BELIZE CITY, Tues. Apr. 28, 2015–Sometime after 9:30 p.m., on Saturday, April 25, there was a brawl inside The Blue House Bar, located between Miles 8 and 9 on the Philip Goldson Highway in Ladyville, and by the time police arrived on the scene, a man was lying dead on the floor inside. After being in police custody since Saturday night, Darrington “Percy” Hamilton, a security guard employed at The Blue House Bar, was this morning escorted by police to the Belize City Magistrate’s Court, where he appeared before Chief Magistrate Ann Marie Smith, who arraigned him on a single count of murder for causing the death of Wilmer Antonio Cisneros, 41. No plea was taken from Hamilton and the Chief Magistrate remanded him to the Belize Central Prison until his next court date on July 22. Cisneros, a Honduran national who worked as a supervisor at M&M Engineering, was stabbed in his abdomen and chest during the brawl inside the club, where a fight had broken out between a group of men who were with Cisneros and two security guards of the establishment. Cisneros and a group of his friends had gone to the bar to have a few drinks. Things, however, got tense when the security guard asked that they pay the entrance fee. Reports are that Cisneros indicated that he was not going to pay, and harsh words were exchanged between one of the security guards and the group of men. Before long, tempers had escalated and a classic bar brawl erupted, with chairs flying and men wrestling on the floor, as other patrons scrambled for the door. During the fight, Cisneros, after he was stabbed, fell between two bar stools and was hanging there until he was removed and put on the floor, where he continued to bleed profusely from his stab wounds. An eyewitness who spoke on condition of anonymity told Amandala that about two hours after the incident, Cisneros let off a loud gasp and never moved again. By the time the BERT ambulance arrived on the scene, Cisneros was already dead. The ambulance, however, transported Roger Jimenez, 30, a Nicaraguan national and construction worker who resides on St. Thomas Street in Belize City, who was suffering from a minor injury, to the Karl Heusner Memorial Hospital. Police scenes of crime technicians arrived sometime later and began processing the scene, while some of the patrons who were inside the bar when the incident occurred went along with Ladyville police to give statements. Amandala has also learned that police did not recover the knife used in the stabbing. Initially, police had detained two security guards, but one was released without being charged. 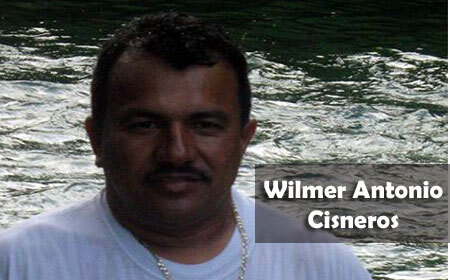 Cisneros was the father of two daughters and his wife is 7 months pregnant.